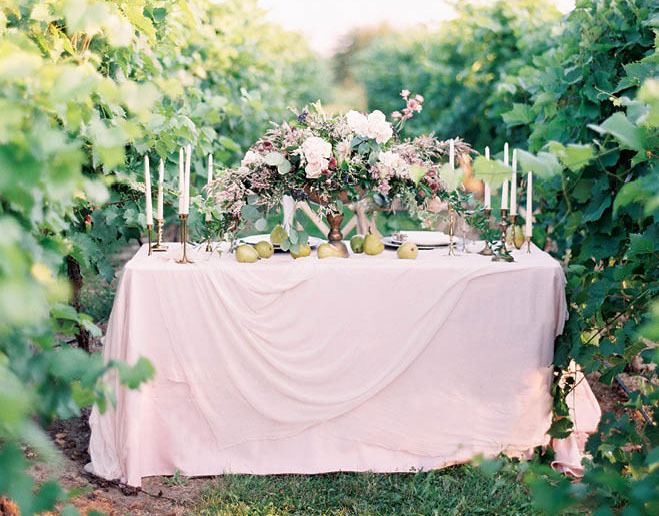 (Above) “Inspired by the sprawling beauty of Lautenbach’s gorgeous vineyard in Door County, we worked with a minimalist palette, with shades of blush and lush greens,” says wedding planner Allison Eberhardt of Et Voilà Events, the mastermind behind this shoot. An intimate sweetheart table, just for the bride and groom, overflows with rich, bold blooms and romantic candlelight, all atop rosy linens. (Below) Main Grain Bakery in Steven’s Point—a go-to for artisan breads, sweets and one-of-a-kind wedding cakes—whipped up this Mr. and Mrs. confection that’s topped with figs and blackberries. Not only is it a perfect slice of something sweet on your wedding night, but you can also treat yourself to the same kind of cake year after year on your anniversary. Rosemary grown by florist Fawn Mueller of Inspired by Nature, variegated ivy, Italian ruscus and seeded eucalyptus, along with blush calycina for a burst of color, come together to form this stunner of a wreath. Incorporate it into your ceremony backdrop, then your reception décor, for a touch of nature. While you and your groom enjoy your cake made for two, serve your guests a piece of this coordinating cake. The two tiers are decorated with a delicate wreath and topping of blush calycina. Fashion a signature cocktail for your guests to indulge in, like this Champagne concoction topped with blackberries and a sprig of rosemary. It’s bubbly, fruity and gorgeous—what more could you want? Natural-wood crossback chairs, along with trailing ribbon and greenery, add to the rustic romance of this wedding theme. Meanwhile, the tablescape centers on a classic color combination of gold and rose. Gold flatware sits alongside beautifully bronzed vintage chargers, topped with rose-quartz name cards. Bon appétit! Give guests a peek at what’s to eat with elegant yet modern menus atop their place settings. Pair a whimsical script with a classic serif font for the ideal mix of new and old. Big, bold and beautiful—this oversized bouquet features Blushing Bride proteas, garden spray roses, pink astrantia and Talea roses, with a variety of greenery tucked between the blooms. You’ll wish you could carry it every day. Florist Fawn Mueller of Inspired by Nature is intent on using as many locally grown flowers as possible—most come from within five miles of her Wausau studio. “I hand-select the blooms from the plants, and they go right into the designs that evening,” says Mueller. Here, a centerpiece echoes the vibe of the bouquet, incorporating garden spray roses, pink astrantia and greenery such as eucalyptus, ivy and fern.